A stylish open living area is filled with natural light and intelligently designed furnishings. Cook your favourite meals in the fully equipped kitchen, stocked with the finest appliances. The bedroom is the ultimate haven, with the plushest bedding, beautiful furniture and ample room to stow away your belongings. A spacious en suite bathroom with toasty underfloor heating, a rain head shower, deep bath and smart TV is the final ingredient to this relaxing retreat. Though the design subtly echoes the buildings Art Deco history, your apartment is truly primed for the 21st century lifestyle. Triple glazed windows with sumptuous curtains and interactive blinds allow peace and privacy, and the latest intuitive technology has been expertly woven throughout. Temperature and lighting can be matched to the moment with a touch of your apartments tablet, allowing you to command the atmosphere of your urban sanctuary. 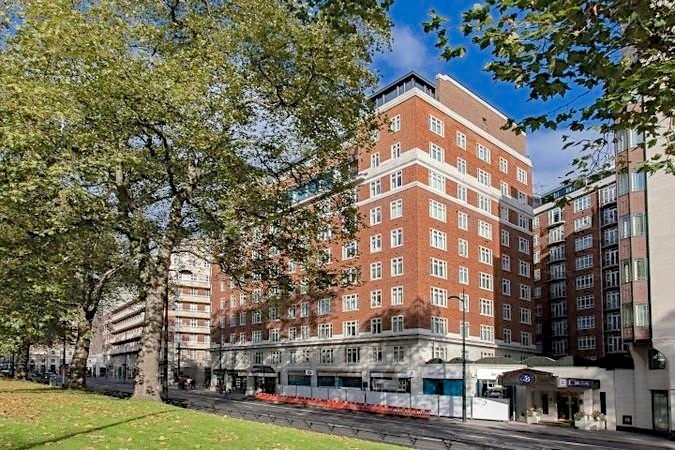 We at Hyde Park Residence cant keep quiet about our unique location (the clues in the name). Perched on the edge of the park and planted in the atmospheric opulence of Mayfair, our residence is the ideal base for an extraordinary stay in the heart of London. Our local patch of town is luxuriously close to the capitals most desirable business, shopping and cultural destinations. From clusters of gourmet restaurants to illustrious art galleries, the theatrical buzz of Soho, and even Buckingham Palace, everything is at our fingertips. Closer to home, the distinctive red-brick houses and exclusive feel of Mayfair; will make you want to pop outside to watch the world go by. We are friendly with our neighbours and familiar with all the hidden gems around us & so we’ll gladly help you fit right into the area. Of course, our favourite treasure is our front garden; one of the largest, most lush green spaces in the capital. Whether youre in the mood for a peaceful stroll with nature or a bustle about town, both can be done from our doorstep. Nourished by the park and invigorated by the local urban scene, our versatile and inspiring location will show you exactly why London is worth all the time you can spare. Tenant fees: We charge £275 + VAT (£330 inc. VAT) to cover the costs of administration, references and agreement preparation. Additional fee may apply for the inventory, quote can be obtained depending on the size of the property.